Transitioning to a single life with two kids and a full-time home business played havoc with my housekeeping skills. So after finding myself marooned in a sea of laundry with a layer of cat hairs on everything in sight, I decided it was time to take action. Finding inspiration from Flylady and Cath Coulson, I've devised a weekly routine which helps me keep on top of everything with the minimum of fuss. Now taped prominently to the kitchen door, my Keeping House sheet is helping me stay organized and has the bonus of telling OH and the kids what they could do to earn brownie points (and perhaps absolve a little of the stress from my day). Here follows my fuss-free guide to keeping house for anyone else who feels there just aren't enough hours in the day. Clear out the clutter, fast! 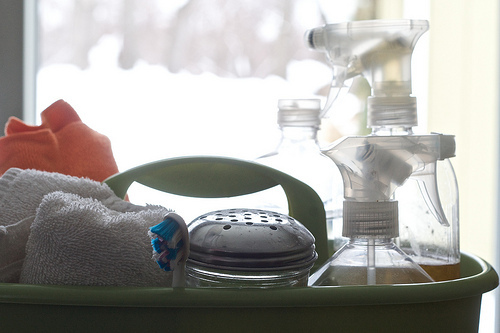 Less clutter = less to clean! One of the easiest ways to keep a manageable house is to keep the things which need to be cleaned (or tidied away) to a minimum. Decluttering an entire home can be incredibly time consuming, so if you need to get this done fast try the following technique. To begin with, do this only for things in sight or which would get in the way during your day-to-day life. As you settle into a housekeeping routine, you can work in concentrated bursts of declutter as required. I really wish I'd listened to Mum the first time she said this as it's the most useful housekeeping tip I've ever had! By doing these things you'll likely find there's hardly any mess to clean and your routines will be finished in minutes! My Mum likes to do certain tasks on particular days of the week; she's done this for years and gets quite agitated if the chores aren't complete on a particular day... But her routines certainly pay off - my parents' house is dust-free, gleaming and worthy of showhome status any day of the week! I only wish I could be so organized, though my own (toned-down) routines ensure I don't have to panic at the thought of unexpected guests! My preference is to do a little each day, allowing me the greatest flexibility with kids and (7-days-a-week) work, with less at the weekends so I have at least some time to relax! If it suits you better, you could squash all tasks into just 2 or three days, or swap out weekend jobs to allow more time for putting your feet up. Change the sheets on all beds, wash dry and put away. There's nothing quite so nice as slipping between clean sheets at the end of a long day! Feather dust throughout the house - feather dusters are quite wonderful, much quicker (and easier) than using cloths and polish. Ostritch feathers are perfect, though we usually make do with a 2-pack from Poundland! 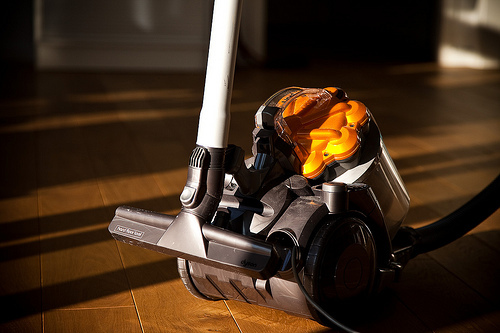 Vacuum from top to bottom - once a week for the whole house, plus once more for communal rooms. Perhaps once more if you have pets..? Wipe kitchen appliances and cupboard doors - just a once-over will suffice. When done regularly, it makes a helluva difference! Clean the fridge - throw out anything inedible and wipe down with a mild soapy solution to avoid anything nasty building up. The first time, it may require some work, but afterwards this weekly cull will make sure it never smells bad again. Plan grocery shop or book your home delivery - I love avoiding the supermarkets by having groceries delivered. After cleaning the fridge, you'll have a better idea of what you need to buy, and by planning ahead will be able to resist the urge to spend needlessly. My "financial week" begins on a Thursday and so this is the day when I usually complete all my errands and have the shopping delivered. You could always swap this out if your own weekly routine conflicts. Run errands (return library books, buy stamps, donate unwantables to the charity shop, etc). Clean out your purse and handbag - it's surprising how many receipts, papers and wrappers gather up in a week! Tidy kids bedrooms - we've established this as a Saturday regularity as my children are old enough to do their own! Vacuum or sweep communal areas if needed - with messy children andthree cats, a quick once-over at the weekend really helps. Sweep front doorstep and wipe door - just to make sure it's always welcoming. Tidy or tend to the garden - one to share with your OH or children if they're willing. Not quite so important during winter months. 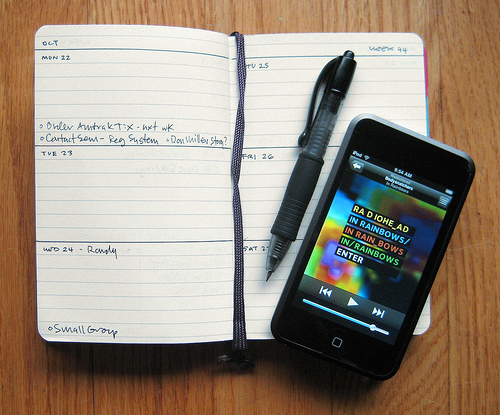 There's likely to be tasks which need to be done every day of the week. While mine is quite a list, I try to complete them alongside other tasks so they don't take up much of the day. Make beds - if your children are old enough, they can straighten their own. Swish toilet and wipe bathroom sink - done daily they will always be gleaming. I do mine when I first get up and leave them alone for the rest of the day. 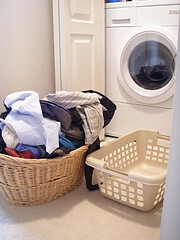 Wash, dry and put away laundry - do a load every day if you have enough to fill the washing machine. It's far easier in small chunks than trying to lauder a mountain in a single day! Empty the kitchen bin even if it isn't full. That way you won't have any smells lingering overnight. Put all dirty clothes in the laundry basket. I have this on my printed sheet to remind men and child-folk that clothes don't live on bedroom floors! Little and often seems much less time consuming than periodic bursts! Where possible, it's easier to clean areas as you realize they need it. In other words,don't put off until tomorrow anything which could be done today. If you don't have the time, make a mental note to deal with it the next time you're sprucing up the area. 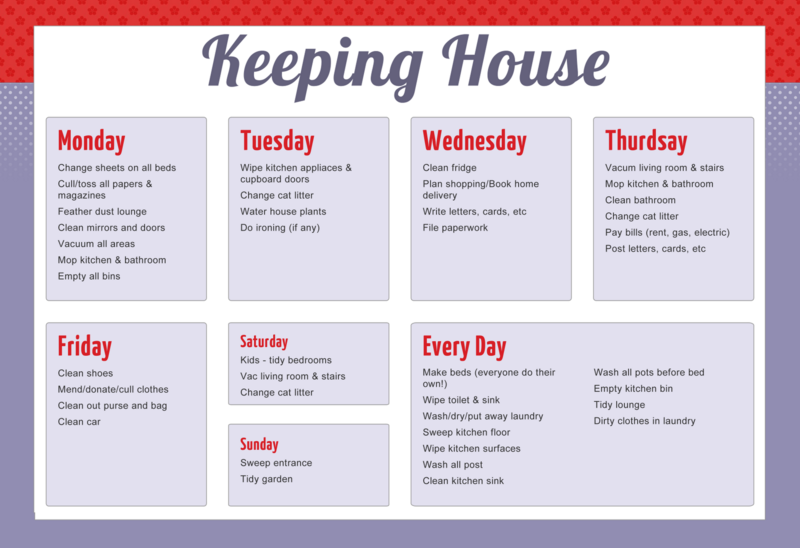 I hope you've found my "Slacker's Guide to Keeping House" useful! If you have any tips of your own or would like to offer your own insights, please feel free to leave your comments below. Image credits (in order of appearance): "A clean house..." via thisgeekredes, vacuum-cleaner by owagner, "Cleaning day" byjaymiek, planner by mike rohde, "Spring cleaning supplies by Chiot's Run, "More Laundry" by pomomama.